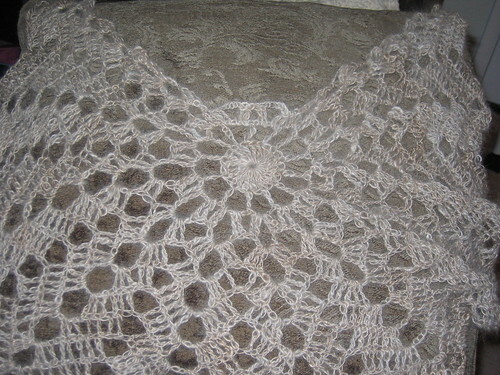 The $1 Shawl… a sort-of Granny post. Hi kids! This is not a granny-square post, except that it is… it starts off with no more than the usual chain/join/crochet-chain-crochet patterns! Funny, the things you can do with granny circles. I call this the $1 Shawl. Funny story! I bet my mom $1 I could finish it in a week. I second that! Very lovely. Thanks! 🙂 I’m thinking I might add a semi-weighty bead to each of the points at the last row; seriously, this yarn weighs NOTHING! I think that’s why it’s taking as long as it is, actually… it’s not like your standard sturdy wool, that you can whip around and abuse… I have to handle this like fine china!! The name ‘granny’ so does NOT fit this shawl. It looks really pretty and airy…perfect for Spring evenings. That being said, the warped side of me thinks it would be great in black with spiders hanging from the points….like something Morticia would wear! Halloween anyone?